Starting with the frontage, this SUV is designed with a large windscreen, which is accompanied by a couple of rain sensing wipers. It has an aggressive radiator grille that has horizontally positioned slats. It is flanked by classy headlight, which is incorporated with powerful Xenon lamps and LED day time running lamps. The bumper is painted in black color and houses a large air intake section for cooling the powerful engine quickly. Its side profile is designed attractively and includes some interesting features like black colored door handles, side protective molding and wheel arches. The outside rear view mirrors are electrically adjustable. Its neatly carved wheel arches are fitted with a classy set of alloy wheels, which are covered with a robust set of tubeless radial tyres. Whereas, its rear end includes a radiant tail light cluster, which is incorporated with bright reverse along with brake lights and indicators. It is integrated with a centrally located high mounted stop lamp that adds to the safety quotient. The rear bumper is smooth, which is fitted with a pair of reflectors along with rectangular shaped exhaust pipes. Its large tail gate is affixed with a spare wheel, which gives the SUV a rugged appearance. Its overall length, width and height are 4763mm, 1855mm and 1938mm respectively. The minimum ground clearance is about 217mm, which makes it capable for dealing with any terrain. The internal cabin gets a lustrous design with a lot metallic and wooden inserts. The company has focused a lot on giving an upmarket finish to the cabin. The best part about the interiors is its cockpit, which has a lot of leg, shoulder and head room. Its dashboard has a curvy yet sleekly sculptured design and it is done up with a dual color scheme. In terms of seating, the cabin is incorporated with ergonomically designed seats, which are covered with brand new Designo Nappa leather upholstery. These seats come with heating and ventilation function along with adjustable head restraints. They not only offer maximum comfort, but also provide good support for back and thighs. The driver's seat is 10-way power adjustable along with memory functions, while the foldable rear seat allows to bring in more luggage. The gear shift knob as well as steering wheel is also wrapped with premium leather. In addition to these, it has wood inserts on dashboard and console that gives a rich look to its interiors. The company has given it an advanced instrument panel with a stylish 4.5-inch color display that provides several notifications and warning for keeping the driver alert. It provides informatics like outside temperature, trip computer, fuel consumption, fuel gauge, distance traveled, vehicle speed, gearshift position, tachometer and driver's seat belt warning. It is fitted with a 5.5-litre Biturbo petrol engine that comes with a displacement capacity of 5461cc. This mill has the ability to produce a peak power of 544bhp along with a hammering torque output of 760Nm. It is cleverly mated with an advanced 7-speed, G-Tronic automatic transmission gear box. It enables the vehicle to attain an impressive top speed of about 210 Kmph and can cross the speed barrier of 100 Kmph in close to 5.4 seconds from a standstill. At the same time, it is incorporated with an advanced fuel supply system, which allows the vehicle to give out a maximum mileage of around 11 Kmpl on expressways. The car maker fitted all its wheels with ventilated disc brakes. It is integrated with hill start assist, brake hold feature as well as anti lock braking system, which further boosts this braking mechanism. It also has an electronic stability program that adds to the safety quotient. On the other hand, its both axles are affixed with longitudinal and transverse links. These are further accompanied by AMG calibrated coil springs as well as gas-pressurized shock absorbers. The internal cabin is incorporated with an electromechanical power assisted steering system that offers a very good response. The company has bestowed this luxurious vehicle with a lot of innovative aspects, which gives the occupants a plush feel while traveling. It has an efficient dual zone air conditioning system that features automatic temperature control. The center console is equipped with a sophisticated music system, which also comes with a touchscreen navigation system. It also has power assisted multi-functional steering system, which is mounted with audio, call and cruise control switches. Also, it has an optimized media interface with a consumer cable kit, which is useful for connecting portable media players. Apart from these, it also has cruise control function, rear view camera with display, interior rear view mirror with auto dimming function, illuminated entry and many more features. For a stress free driving experience, this vehicle has a lot of protective aspects. It is equipped with an advanced aspects like airbags including dual front, side and head airbags, which keeps the occupants protected. Also, the seats are accompanied with 3-point ELR belts, wherein the front seats also have pre-tensioner and load limiter function, which keeps the occupants firmly in position. It has an advanced feature like PRE-SAFE occupant protection system that detects critical driving conditions. Moreover, it also activates preventive measures in order to reduce the risk of injury to its passengers. In addition to all these, it also includes NECK-PRO crash responsive head restraints, downhill speed regulation, tyre pressure loss warning system, remote door locks and night security illumination. The company has also blessed this variant with an electronic stability program that helps in maintaining stability irrespective of road conditions. 1. Excellent engine performance with decent acceleration and pick-up. 2. Decent ground clearance of 217mm makes it perfect for off-roading. 1. Cost of maintenance and spares are quite expensive. 2. Its long turning radius is a drawback. 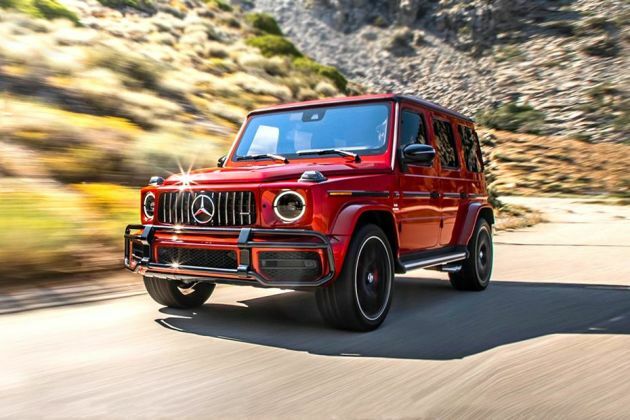 The new G-Class will continue to use a body-on-frame construction, and it, unsurprisingly, has bettered its legendary predecessor off-road! This is the biggest overhaul the legendary Gelandewagen has received in almost 40 years of its existence! This is the first update Mercedes-Benz India has given the G-Wagen in the country since the Crazy Colour edition was launched in 2015!